I am using Infragistics grid in MVC3. In the Infragistics grid i want a column to have a checkbox and this checkbox is checked based on the data from the database. Could you please guide me how to do with MVC3 razor. I need to replace boolean columns in every level of a igHierachicalGrid with checkbox columns. I was successful to do so in a igGrid using jquery templating but had no luck with the igHierachicalGrid. I've taken a demo from the installed files of NetAdvantage for jQuery 2011.2: <drive>:\Program Files\Infragistics\NetAdvantage 2011.2\jQuery\demos\igHierarchicalGrid\RowSelectors.html, and modified it to fit my requirements (attached you can find the altered version). But it doesn't work, what am I doing wrong? We have some known bugs for igHierarchicalGrid templating and you hit one. Because jQuery templating is not actively developed anymore we are looking forward to write our own templating engine which we will release in our next version of NetAdvantage for jQuery product. Until then I've workaround for your case. You can find in the attachment the working sample. Note that this workaround works only with our latest service release which is 2012.2.2084. In your sample there are 2 issues. The first is that you don't have column key placeholder in the first TD tag. The second is that the If statement doesn't work for the top level grid in the igHierarchicalGrid (you can see that the If statement is working for the sub levels). I resolved the first issue by adding the value attribute to the checkbox which value is the value of the ProductID column. This code adds disabled attribute to the checkboxes which have ProductID greater than 5. There is one more issue with the template which is that the spaces are trimmed from the template. This issue is resolve in build 2084.
format: 'checkbox' is the new functionality. see the attached screenshot - that's how it looks like. Thanks for your response. That worked fine for a two level igHierarchicalGrid, but it appears that for a grid with more than two levels the problem propagates to all levels except the last one. I've taken your working sample and applied your changes to another example with a igHierarchicalGrid with more than two levels (you can find this in the attached file). As I see it, when we get all the elements with the "checkMe" CSS class, the only elements that are obtained are the ones for the top level grid, but not for the inner level grids. How to go in this case? igHierarchicalGrid does not render child grids initially (if they are not exapnded). My workaround with "checkMe" class is working only for the root grid. That's why this approach doesn't work for the inner level grids. Then why you see that igHierarchicalGrid is working for two levels? In the sample I've attached in my previous post the second level grid has "if" condition in the template. This "if" condition disables the checkboxes in the child grid. After I've made some tests I concluded that "if" statement is working in the template only for the last level in the hierarchy. I've attached another example in which I have this multi level checkbox problem solved. This function contains the code from my previous post with some optimizations. For example I remove the "checkMe" class from the checkbox after I process it. I also have a handler for "rowExpanded" event which basically calls disableCheckboxes function. When this event fires the child grid is already expanded and I can iterate through the newly created checkboxes. You can find all code in the attached sample. 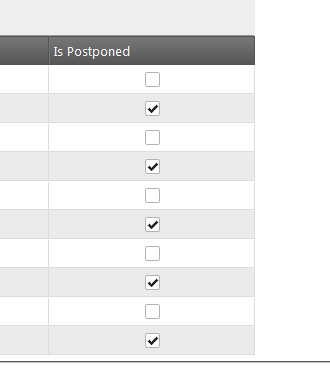 Note: In 12.1 we will ship checkbox support in the columns out of the box. 12.1 is going to be available in April, so stay tuned.